Our team of employees are constantly working to meet the needs of the community through services, activities and events. 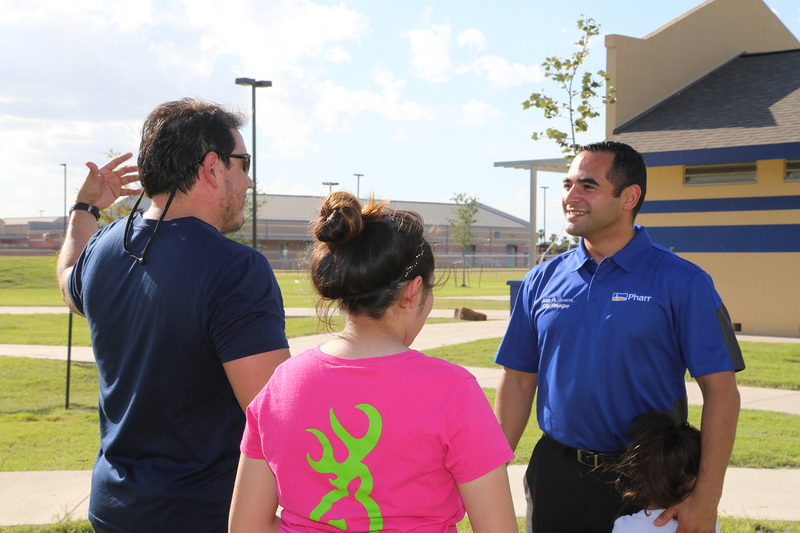 Enhancing the quality of life for all Pharr residents is at the core of this new fiscal year. The residents of Pharr should notice the change in the city's culture where Professionalism, Respect, Integrity, Discipline, and Ethics (PRIDE) are expected out of every one of our employees. The residents should also notice the priorities for the new fiscal year focused on responsibly improving the infrastructure needed for a better quality of life: streets and parks! The quality of life for our residents and families will continue to be improved through better streets and improved park infrastructure to include several new parks. For the second year in a row the improvement of our streets will be funded in an amount never seen before last year. Mayor Ambrosio Hernandez and the City Commission created a policy to ensure that all City streets are upgraded. This was a major policy change since such will require the investment of roughly $4 million every year for four to five years. This is to improve roads in south, central, and northern Pharr. To identify if your street is preliminarily scheduled for repair (subject to change based on annual funding), please feel free to look at the City's webpage, Streets Division where the four year plan is identified per year. A quick description of eight new parks and the upgrade of two current parks are included in the following section. One park not included in the following pages but must be discussed is the identification of 100-200 acres for the future development of a major community park. The next generations will benefit greatly from this progressive forward thinking vision, providing a major piece of land where families can gather and enjoy our environment, enjoy familiy-time, and enjoy Pharr! Apart from improvements of city parks and improvements in our streets, safety in all school zones is also a priority. For the first time the City has budgeted for speed cushions or speed radars to be installed in every school in Pharr to ensure the safety of children and pedestrians as they go to and from school. Something else new to this great city: diversity of community festivals! These festivals serve as a way to increase PRIDE in our community and to increase opportunites to have safe family events in your city. In a fiscally responsible manner the City is attempting to have at least one community festival or celebration every month. The events will be held in all areas of Pharr: north, central, and south Pharr. Some of the new events are the American Independence Festival (4th of July Festival) in north Pharr, and Mexican Independence Celebration (16 de Septiembre Festival) in south Pharr. With the new fiscal year's priorities along with our great partners at PSJA, we can allow for the current and next generation of residents to benefit from the hard work of our employees and the leadership of our Mayor Dr. Ambrosio Hernandez and all of our City Commissioners. I was hired by the City of Pharr in 2007 to develop and roll-out a program that would fix and reverse the negative trend in the City’s fiscal health, and then maintain the City fiscal health for the long-term. This was accomplished and as of today, the City’s finances have never been better. Now as City Manager, I have a great team of employees that help make the City a great place to live, work, and play. It is because of the leadership of Mayor Dr. Ambrosio Hernandez and the City Commission that many great changes have taken place.